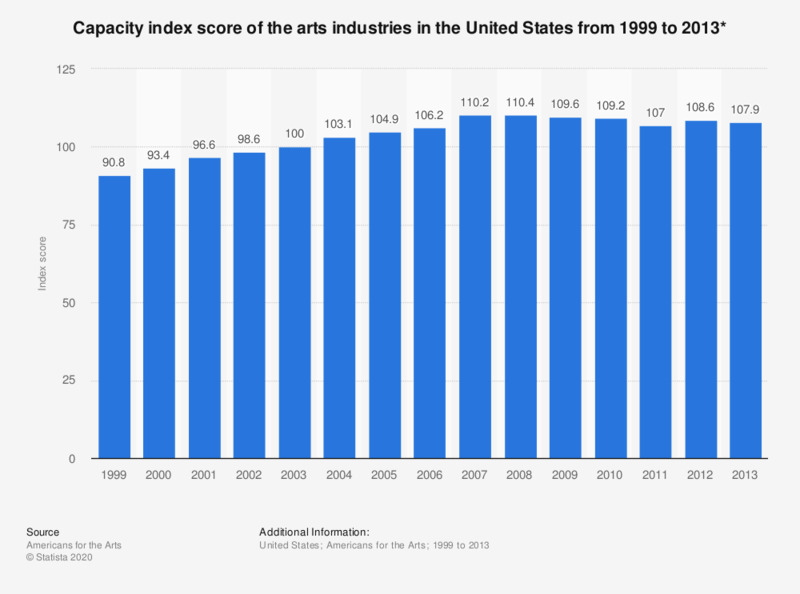 This statistic shows the capacity index score of the arts industries in the United States from 1999 to 2013. In 2013, the score of capacity indicators for U.S. arts industries decreased to 107.9, down from 108.6 the previous year. * The National Arts Index measures the vitality of arts and culture in the U.S. It is set to a base score of 100 in 2003. Depicted in this graph is the index of all the capacity indicators, which measure relatively durable levels of institutions, capital, employment and payroll levels in the arts and culture system. Capacity and infrastructure transform financial flows into arts activities.